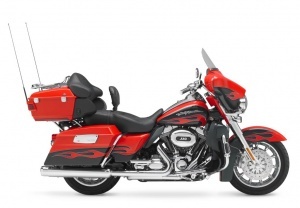 The Harley-Davidson® CVO™ Street Glide® is a limited-production version of the popular Harley-Davidson® hot-rod bagger. Powered by the largest-displacement V-Twin engine offered by Harley-Davidson, this potent touring bike is loaded with sparkling chrome, electrifying paint and fresh custom-styling ideas. 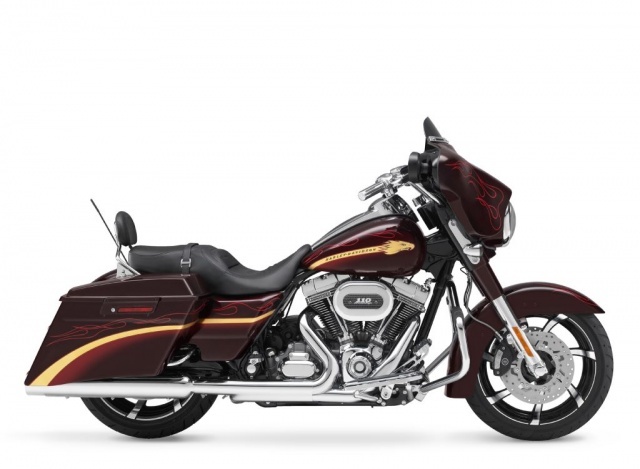 The CVO Street Glide is built on the innovative Touring chassis introduced by Harley-Davidson in 2009, based on a single-spar, rigid backbone frame and a new swingarm developed to withstand the demands of long-haul touring riders and today's more-powerful engines. According to various sources, it appears that Harley-Davidson is experiencing a significant downturn. Here's our demo video shot at the 2008 Easyriders V-Twin show in Sacramento, featuring an interview with Jim Giuffra of AFT Customs, and Jaxon Fyffe of Wild Card Customs describes his sweet Speedliner custom. A sampling of event photos are included -- babes and bikes!